Today, Vampires still roam our streets and influence those around them to do their bidding. Vampire Hunters are not far behind, using whatever makeshift weapons they can find, including hockey sticks, garlic stun-guns, yield sign shields, and anything else that will help. You’ll represent either Vampires or Vampire Hunters to defeat your rival. Along your path, you’ll need the help of others, including werewolves, human groupies who want to join your side, elves, giants, and a host of other creatures. Who will win? It’s up to your choices as you build a force set on ruling the night. 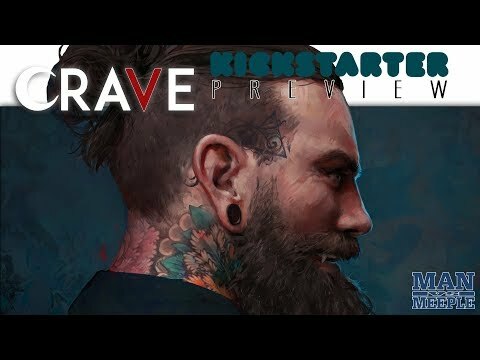 Crave is a deckbuilding game. You will begin the game with a simple deck of 10 cards, and then use your cards’ abilities to acquire better cards, adding them to your deck along the way. Your strategy will vary, based on the availability of cards in the public and private markets, as well as your existing cards, opponent’s strategy, and flow of the game.